Hydraulic rising bollards are designed especially for high security vehicle entrances and for a location (Military area, embassy, governmental area etc.) that has to be closed for motorized traffic on specific times. They can be installed as a single unit as well as in groups. Bollards are driven hydraulically and the hydraulic drive unit is placed in an installation cabinet close to the bollards. 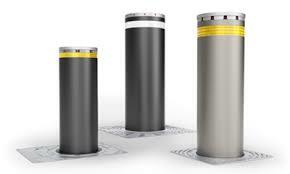 In case of power failure bollards can be lowered manually. With the help of plc/microprocessor controlled electronics, raise/lower function can be achieved by every kind of card readers, biometric readers, radio control, on/off switch or key switch etc. Besides, safety accessories like loop detectors, photocells, flashing lights or red/green lights can be integrated to the control electronics very easily. For the hydraulic bollard operating in a unit of 2,4. Kw electric motor and 14 cc hydraulic pump, 8 lt of oil tank connected there to, 220 V open center solenoid valve, temperature and oil level indicator, heater or cooler (optional) depending on the ambient conditions, evacuation valve or for opening the road for traffic in the event of power outages and failures are used. Control automation of the system is contained in a box with the sizes of 60x40x20 cm.